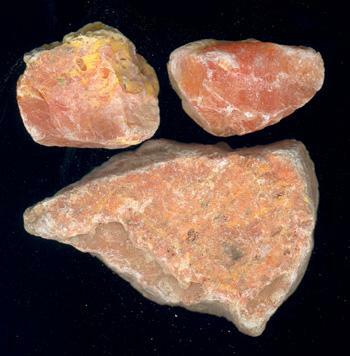 Aresnolite mineral or processing product of arsenic-containing minerals such as arsenopyrite and realgar. Mainly in Jiangxi, Hunan and Guangdong provinces of China. Mined all the year round, divided into white arsenic and red arsenic, both of which the content of arsenic toxide (As2O3) is over 96%. But the former is purer, for the later still contains a little red substance such as yellow arsenic and for medication, the red arsenic is mainly used. Pieces shaped, with crystal streaks, without dregs. The refined item of sublimed Pi Shi is Pi Shuang. Pungent, extremely hot; strong toxic; lung and liver meridians entered. Counteract toxic pathogen and kill parasites, corrode wound and remove putridity for external application, eliminate phlegm and relieve dyspnea for internal application. Being strong toxic, it can counteract toxic pathogen and kill the parasites, remove putridity for external application. Although it can be singly indicated for application compress, its strong causticity makes it necessary to add other herbs to lower the concentration as to lower its toxicity. For abscess, deep-rooted carbuncle, and malign sores, it is often combined with Xiong Huang to help the erupting of sores and discharging of pus for local application. For scabies and tinea, it is often combined with parasites-killing and tinea-curing herbs to obtain the actions of killing parasites and curing tinea and relieving itching. For instance, it is combined with Liu Huang and Qing Fen, etc., and made into ointment for external application. For hemorrhoid, it is often combined with heat-clearing and toxicity-removing and dampness-astringing and wound-healing herbs. For instance, it is combined with Ku Fan and Wu Mei for external application. It has actions of dispelling cold, eliminating phlegm and relieving dyspnea for internal application. For chronic cough and dyspnea caused by cold-phlegm, it is often combined with Dan Dou Chi to make into pills, such as in Zi Jin Dan from Pu Ji Ben Shi Fang. In addition, it was indicated for malaria in ancient formula. Take proper dose for external application. Ground into powder for external application. It's better used in compound-prescription powder, or made into plaster or medicated thread. Take pills and powder 0.002~0.004 g per time for internal application. With strong toxicity, the dose should be strictly controlled for internal application. For external application, attention should also be paid to prevent local poisoning. It is contraindicated for the pregnant women. It should not be used in alcoholic preparation. It should not be combined with Shui Yin according to nineteen incompatibilities.